Think back with me to that time when being outside changed you. My emancipation from pavement arrived on the back of my 1968 Schwinn Sting-Ray. I pedaled that banana seat bomber to where the side walk ended – Charlotte’s Sugar Creek Wastewater Treatment Plant*. An adventure which sparked a wildfire of exploration as we flew down poison ivy’d trails through a wilderness of kudzu, cicadas and creek beds. Growing up, we poured energy into outdoor play with little regard for who built the trails that provide our access. Time and space seemed abundant. And as for the trail-builder, we assumed it was the boogie man – some sasquatch who might appear at any moment and bring it all to a grizzly end. Such fears served to increase our sense of adventure as we escaped the ordinary world to a land of wonder. Today our fear is less about sasquatch and more about the rapid decline in youth getting outside. You and I know that people need time in nature for their health, happiness, and well-being. But increasingly, children and families are living their lives indoors. It is for this reason that the Great Outdoor Provision Co. is working with the Conservation Trust of North Carolina, a statewide land trust, to provide a new and meaningful opportunity for youth to connect with nature, and we need your to establish the North Carolina Youth Conservation Corps (NCYCC). Merrell Footwear joins us in this effort because YCC programs are proven to be effective at connecting young people to the outdoors while also providing valuable enhancements to our protected lands. 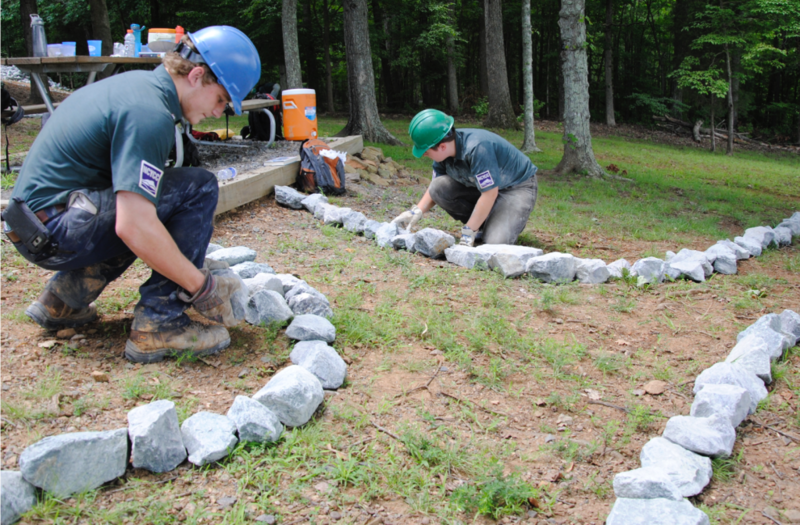 The North Carolina Youth Conservation Corps will meet the needs of older youth in our state. There are multiple nature programs for young children in North Carolina, but very few offered for teenagers and college age youth. It is important to reach this age group while they are developing their environmental ethic and making career decisions. The NCYCC is a comprehensive youth development program that uses the natural world as a platform for teaching environmental stewardship, job and life skills, leadership, community service, and personal responsibility. This summer, two “crews” of 8 to 10 youth ages 16 to 24 will work together outdoors under the close supervision of two highly trained adult leaders on high priority conservation projects. The crews will work 7 hours a day, 5 days a week, for 4 to 7 weeks on local, state, federal, and land trust properties. An additional hour is budgeted each day for learning about conservation topics. Crews usually live together outdoors near the project site, making the experience a unique opportunity to bond together in nature as a community. Crew members will be paid minimum wage, creating a real-life work environment and attracting young people with diverse backgrounds. They will contribute valuable service to their communities and learn the meaning of personal responsibility and hard, rewarding work. CTNC needs your help to launch this vital program. Shop with us on Saturday, June 1st, and 10% of your purchase goes to local land trusts. The NCYCC is a win-win for everyone. Crews work on projects such as trail construction and maintenance, habitat restoration, and community gardens that enhance the natural landscape and open up more conservation lands to the public. This summer, one crew will build a trail in the Croatan National Forest on the Coastal Plain, and another will work at various sites in the Triangle, including projects near Falls Lake and on the Mountains-to-Sea Trail. CTNC hopes to expand the program for 2014 so that a number of crews will be operating across North Carolina. One important element will be placing crews on properties that local land trusts own, so that those protected areas can be enhanced for public enjoyment. Please join me in supporting CTNC and the NC Youth Conservation Corps. You have an opportunity to contribute to a force for positive change. Your financial gift will help us organize and support YCC crews to work on real conservation needs and provide opportunities for North Carolina’s young people to experience a life-changing summer. *In 2008 the Sugar Creek Wastewater Treatment Plant received the Gold Award from the National Association of Clean Water Agencies. Mecklenburg County’s Greenway Master Plan includes an extensive recreational corridor for this area.